Can you name a turquoise insect with yellow spots? Many thanks for your nice comments about my site! I think the insect you are looking for is a Green Tiger Beetle (Cicindela campestris). 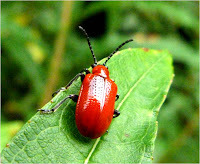 It's a beautiful beetle, but unfortunately I haven't found one yet, so I don't have a picture of it on my site. I see that you have edited the 'B. lucorum' pic to E. intricarius, and have asked for more advice. I run the HBRG taxon database, and though you are outside our strict area I take records from Argyll and indeed elsewhere. If you are able to provide details (date, place, grid ref) for the insects, some of the records will be very useful, as long as you are happy to have them included in the NBN Gateway sets. You can see more info at www.hbrg.org.uk, the link to 'Taxon database'. Correcting the IDs you have already posted is a major task, but I would be happy to do some of that for groups I know when I am at a loose end. You can contact me if you wish at records@hbrg.org.uk. HI, Can you help me identify a fly/wasp? Many thanks for your post which has really made me think! Whilst there are some solitary digger wasps, these tend to nest in the ground and stock their nest with paralysed insects. So I think the insect you saw is more likely to be a leaf-cutter bee (which look quite wasp-like) as these are also solitary and cut semi-circles out of leaves which they take back to their nests for their larvae. Leaf-cutter bees can be found throughout the UK and often nest in holes in wood, so this would fit with your insect flying into a hole under a window sill. Unfortunately, I don't have any photos of leaf-cutter bees, but you'll find plenty of examples if you Google it. Please let me know if you think this might be it! Hi, I have an enquiry about spiders. I just went to put some washing out and there is a little black one on my washing line and there is a cluster of little things moving around a small part of the line but they look like little caterpillars. They are minute Do you know if are they baby spiders, I don't want to kill a whole family of them if it is. Thanks for your post. Don't suppose you're able to send me a photo of the things you've found? I don't know very much about spiders, but I think baby spiders look like tiny spiders rather than caterpillars. The caterpillar-like things could be insect larvae of some sort. Hopefully they'll go elsewhere on their own and you'll not have to kill them, but you probably don't want them laying eggs on your clothes. Might best to dispose of the washing line if they're still there after a few days. Thanks again - it is very difficult to get clear photos when the things are so tiny - but it's good fun trying! If the camera has a macro setting, it would worth trying that. If your husband manages to get a good shot, I'd love to see it. please send me a photo. Thanks and good luck. hya could you possibly give me an email contact addy, as i would like your advice. I tried to email you, but I got a failure message I'm afraid. Is this email address the right one? Many thanks. If I can, I will be more than happy to credit/ recommend your Website for the pics, as I believe it is fun and of educational value. Thanks in advance, and keep enjoying your entomological studies! Thank you very much for your very kind comments. I am happy for you to use any of my images. Thank you also for offering to credit my Website and I would appreciate it if you were to do that . Hope you and the kids have lots of fun - I wouldn't have a clue what any of the names are in French - they must be clever kids! Hi - I have just been walking down the Clyde Valley near Crossford and saw swarms and swarms of insects flying up the river. There were untold numbers of them and four hours later there were still thousands swarming up-river. They looked like mayflies but a local fisherman said they were granham (?). I can't find anything with that name and wonder if you have any idea what they might be? Thanks for your post. Unfortunately I'm completely baffled. What you have described does sound like a swarm of mayflies. I have looked up all my books on insects and can't find anything called grahams. It's perhaps a local name for them. The only other insects that I know swarm like this are midges and they're much smaller than mayflies. Sorry I can't help out on this one, but if you find out, please let me know. My stone dyke wall - never seen anything like this, unfortunately didn't get a photo-bright red 'fur' though, any ideas? Many thanks for this. Unfortunately, I'm a bit stumped by what you saw, though it sounds quite exiting as I don't remember ever seeing anything like that. The only thing I can find matching your description is a soldier beetle called Trichodes Alvearius. It's red and black and hairy, but you don't find them in Scotland, only in central and southern Europe as far as I'm aware, although sometimes insects you wouldn't expect to find in the UK do start creeping in. I'm up in the highlands quite a lot, so if I ever come across anything like this, I'll let you know. And again, if you do manage to find out what it was, please let me know. Brilliant photos - especially if you've never used that camera before! Absolutely love them. 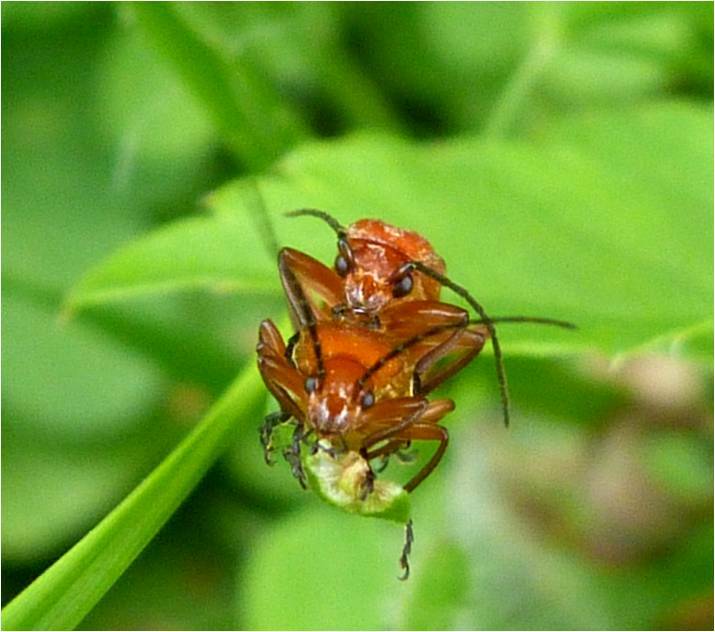 So, I think your first photo is a soldier beetle called Cantharis pellucid. You'll find my attempt under 'beetles' but you've got a far better photo of it than I have. Your second photo I think is a female scorpion fly. I love scorpion flies and there are a few around just now. Worth trying to find a male one as it has a scorpion like 'sting' at the end of its abdomen which is actually its genitalia and not a sting at all (see under 'lacewings/scorpion flies'). Not sure what your last one is. There are quite a few species of little orange flies and they're hard to tell apart. Thanks so much for sending me your photos and well done in getting such great shots. Thanks too for your very kind comments. Looks like you're going to have a lot of fun with your new camera. Please send any other photos you get - I'm always interested to see what's out there at this time of year. Great - look forward to seeing them....! 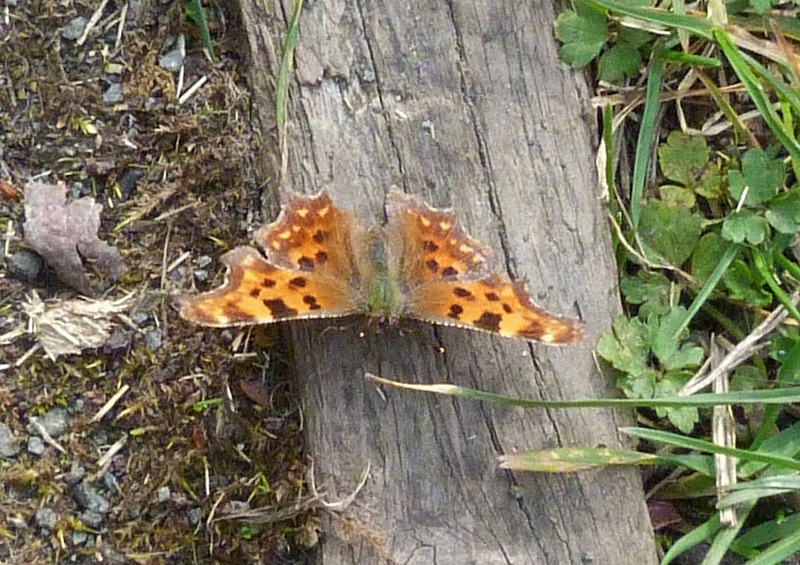 Many thanks for this - it's a fantastically sharp photo you've managed to get - even if it is dead! I think this may be a hoverfly - Volucella pellucens. 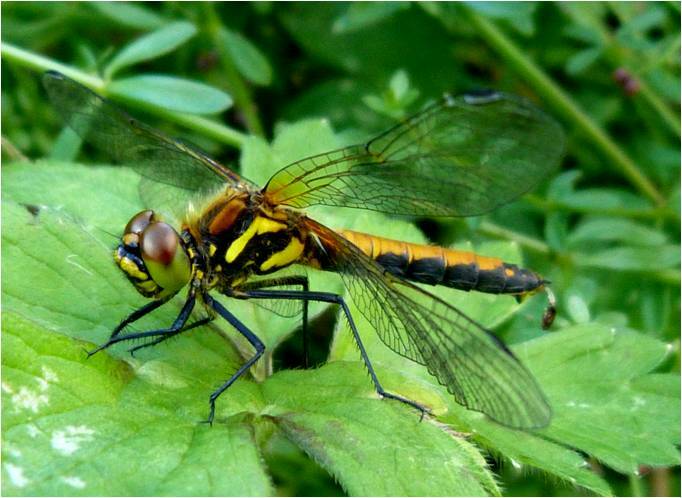 Have a look on my hoverflies page which has one of these on it. Do you agree? It is a stunning creature so thanks for sending me your photo. PS I'm pleased you like my site - please send me any other interesting photos you manage to take. Hi. I wonder if you have any idea what this is. I found it on my front door in Thurso. It's probably very common, but I've never seen one before. Thanks. Many thanks for sending this. Your pictures are very sharp. All I can say is that it looks like some sort of moth to me. I'm afraid I don't have any particular knowledge about moths or butterflies as there are already so many sites and books that deal with this, that I have never studied them. All I do know is that butterflies have a 'bud' at the end of each antenna, but moths don't and the one in your photo just has straight antennae, so I'm pretty sure it's a moth. If you can't find it on the web or in books, I would try http://www.ispotnature.org. You have to register, but they are generally very good at getting back to you with an identification pretty quickly. Good luck, I hope you find out what it is - I like it, it has some very distinctive features. Many thanks. Yes, now you've pointed it out that seems to be what it is. It just didn't look like a moth to me, then again I didn't see it in flight. Thanks again for satisfying my curiosity. Best wishes. Sorry it's taken me a while to get back to you. I'm almost certain what you have is an earwig - and a female one at that as the pincers at the back are straight-ish. The males have quite hooked pincers. Look at my page headed Earwigs/Stick Insects and see if you agree. Thanks very much for sending this to me and please keep sending anything else you find to me. If there were to be a graffiti wall of Scottish insects in profile only what 6 - 12 insects would you choose? I like the sound of this. Well, it will depend a bit on how specific you want the insects to be - for example, would a generic butterfly be ok, or are the artists able for example to graffiti a Peacock butterfly specifically? Whilst there are many exotic Scottish insects (e.g. the green tiger beetle, some long horn beetles), I would have thought you would want to show the Scottish insects that most people in Scotland will be familiar with and will look good on a wall. So with that in mind I would suggest: a midge and a cleg (just because they are Scottish), as mentioned above, a Peacock butterfly (no butterflies on my site I'm afraid, but you can get photos of these easily) a green lacewing (which is truly beautiful), a 7-spot ladybird (stunning and very familiar), an earwig (ok, most people probably don't find them very attractive, but they will be familiar with them), a dragonfly of some description, a grasshopper, a pond skater, a cranefly/daddy longlegs, a bumblebee and/or wasp and perhaps a black beetle of some description. Let me know what you think about these suggestions. It sounds a pretty difficult thing to do and I would love to hear how you get on. Please send me a photo of the finished wall or let me know where it is as I would really like to visit it if possible once it has been completed. Thanks for your post and good luck. Thanks very much for your comments Rob. I'll make this change. Please let me know if you come across any others - all comments are always welcome. Hi, I accidently disturbed a bee hive the other day and identified them as Early Bee's as they had orangy bums, however a larger bee came out and this had whatlooked like a shiny bum with two symetrical hairy circles on the bum. Do you know anything about this? I've tried to find something on this, but I'm really struggling I'm afraid. I'll keep looking and let you know if I come across anything that might fit your description. If you see a photograph of it or anything like it, please forward it on. Sorry I couldn't be more helpful. Thanks for posting this photo - it's an absolutely stunning looking insect and it's pin sharp. It looks to me like a ruby-tailed wasp (either Chrysis angustula or Chrysis ignita) though it might be worth getting someone to identify it more formally as these are rarely (if ever as far as I can see) found in Scotland and it looks like this one was found in Milngarvie! It also looks like it's feeding on nectar which would fit. I've never seen one of these, so I'm very envious. Thanks for sending it on and please send me more if you find anything interesting like this again. I saw an insect near Loch Lomond in June 2015 - it is bugging me that I can't find out what it is!!! Ha ha! What a pun. It was about 2 cm long, narrow, with a brown band in the middle. 3 pairs of fluorescent green spots above and 2 pairs below. Body colour? probably dark grey or black. Walking across path and into the grass. Made no attempt to fly. I saw an insect near Loch Lomond in June 2015. It was about 2 cm long, narrow, with a brown band across the middle and 3 pairs of green fluorescent spots above and 2 pairs below. It crawled along the path and into the grass, making no attempt at flying. It is bugging me that I can't find out what it is. Ha ha! What a pun! Thanks for your query. I'd love to know what you saw that day in Loch Lomond - it sounds so distinctive, I thought I'd know what it is or be able to find it easily, but I can't find anything as yet matching that description. What I can say is that it is far more likely to be a beetle or a bug, as they don't fly away as readily as flies or wasps. The closest insect I can think of (and I confess it doesn't match your description exactly) is the mired bug Dryophilocoris flavoquadrimaculatus which is black with yellowish markings. If you ever find out what it was - please let me know. Many thanks for this Peter - it is great to find someone else who's interested in insects. Many of the insects (and galls in particular) prefer particular plants so I wish I had your knowledge of botany. You can definitely send me the photo you've taken and I can see if I agree with you that it's a dance fly. I will also email you separately. Hi would just like to say thank you for the amazing work you have put into this site. I have used it frequently over the last few years. I do macro photography mostly insects and visit here to help with ID. Many thanks for your comments - they are very much appreciated. I'm delighted you find the site useful. I'd love to see some of the photographs you've taken and any hints and tips you may have on getting a good shot. Hi, this is an excellent site. I've looked all through it and can't identify a little friend I've made who's been checking my typing. We live at 325m in a grassy clearing in a forest between Selkirk & Moffat. The creature looked like a flying beetle (?) and was c. 8-10cm long. It was a caramel brown colour, quite stocky and low-set, wings didn't extend beyond the length of it's body. The wings had distinctive light flecks. It was crawling on the edge of my laptop screen and seemed to be feeling its way with its antennae, which were a redder brown as were its legs. I react badly to bites, so when it got close I tried to catch it to repatriate it outdoors and it just disappeared - didn't see it go, so maybe it jumped. Any ideas what it might be? We need to keep track of the bitey, sting-y ones, so I'm trying to find if it's friend or foe. Thanks for any guesses. Many thanks for your comments. I'm wondering if it was a red-legged shield bug you saw, also known as a forest bug. Although it's technically a bug, it does look a bit like a beetle. 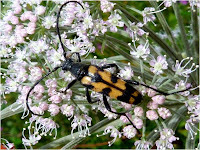 If you go to my 'True Bugs' page, you'll see some photos of one there. Let me know if you think it might be this. And you'll be pleased to know that they don't bite or sting, although they can give off a foul odour if they're attacked, which is why shield bugs are also known as stink bugs. Thanks for your reply. A few tips I would give to anyone who starting out. Practice and don't be to disappointed at first. We all have to start somewhere. Thanks for your reply. I actually use a bridge camera - a Panasonic Lumix FZ45. I have tried a Raynox 250 and I agree it does give amazing magnification, but actually prefer using the Raynox 150 (ocassionally) as it provides greater depth of field, although the magnification is not quite as good. However, I find it really difficult to keep my camera still enough with either lens unless the light is strong enough. Do you have a website or a link to you photos? I enjoyed your Hoverflies especially, as these are an interest of mine. I have some doubts on a few of the IDs. 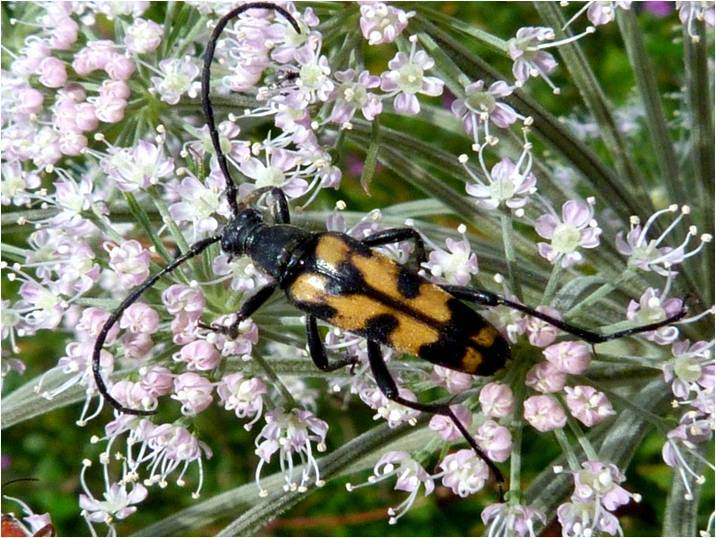 #7 and 8 cannot be S.ribesii, as females of this species have a predominantly yellow rear femur. #13 is Eupeodes corollae, as this is the only female Eupeodes where the abdominal spots reach to the margins, as they clearly do in your case. I wondered about C.impressa for #49 & 50, but not sure due to the location. The tarsii don't look pale enough to me for your ID of albitarsis/ranunculi. #58 and 59 are Eristalis nemorum, with the small sharp wing stigma, and typical behaviour in #58 with the male hovering above the female. #60 and 61 are Eristalia arbustorum with the diffuse wing stigma. So sorry it's taken me such a long to get back to you - I haven't been updating my site much since the end of summer. Thank you so much for all your help on the IDs - I will update all of these during the holidays. I'm always delighted to get some expert help. I really love finding out more about the insects I come across and I know it can sometime be difficult or impossible to ID some of them from photographs alone, so your input is very much appreciated. Thanks again. I've been develloping a new determination key for macro-invertebrates in fresh water, but I'm still searching for gooed pictures to use in my key. I was wondering if I could use your picture of a velia nymf in our key. The deadline for the key in saterday. So I've got to have all the pictures on Friday. Could you let me know if I can use it? Every photographer will be mentionnend with his name, e-mail and website. If you give me your e-mail, I can send you an exemple of the key. Yes, I'm very happy for you to use the photo you mentioned - thanks for asking in advance. And provided there's reference to the web address, I'm happy with that. Many thanks. Many thanks for this Crispin, much appreciated - I'll update the ID on this one. Hi, I saw a very unusual insect at the top of a Scottish Hill (Meall Glas) outside Crainlarich. It was a pair and looked identical to the 'Marmalade Hoverfly' although I would have no idea why it would be up there, it has been about 15 C today, could that have sent the insect high? They were darting around together and when they were stationery letting out a high frequency buzzing noise,I wondered if it could have been a mating ritual? Nice website. I am trying to ID a strange pale green flying insect that has long wings shaped like four adjoining pointed leaves, a bit like pale blades of grass. Behind each wing is an extremely long trailing leg with small branches. The abdomen is quite flat and it has antennae somewhat like a moth's. The entire insect is a uniform pale turquoise-green colour. It was photographed on a dining table in Ballindean near Perth. I wish I could post the photo for you. have you any idea what it might be. Thank you for your post Stephen and your nice comments! Please do post the photo if you can - I would love to see what you have found and try and help out if I possibly can. From your description, I'm wondering if you've found is a male midge of some sort. If you look on my page headed 'Mosquitoes/Midges/Horseflies' you will see a female green midge and some male midges with feathery antennae. However, these only have two wings rather than four. Green leafhoppers under 'True Bugs' have the spiny back legs but not the feathery antennae. You should have a look at both of these - hopefully they might point you in the right direction. Good luck and let me know how you get on! I think your identification of Early Mining Bee haemorrhoa may be wrong. Many thanks for your comments. I think a number of early mining bees are quite similar and difficult to tell apart without closer examination. I've updated my comments on this bee to reflect your comments. Perhaps someone with with greater expertise will be able to assist. might be A. bicolor but i'm a beginner.